"There are different kinds of conferences" as a friend of mine in the Social Connections team said to me in the bar the first evening of Social Connections 9. I know he both was and is right. We had just arrived back from the VIP Reception held for speakers and sponsors at the Mercedes Museum where we took the tour and dined. The tour was quite interesting, even for me who yawns when people start kicking tires. Maybe I enjoyed it most because I'm interested in design and like "shiny things". And there were a lot of shiny, well designed things (cars) on display. After the tour we gathered in the restaurant of the museum for a delicious dinner. 60 guests who were either speakers or sponsors for the event. Six degrees of separation did not apply here, the ones you didn't know, were only one or perhaps two steps away to get to know. I am always amazed on how this community continues to grow and how welcoming it is. Tight but also loose if you understand what I mean. Like an octopus ready to reach out to new friends with one of it's eight arms. This was my fifth Social Connections but little did I know what this particular conference had in store. The next day we arrived at 7 am to IBM and the venue in Ehningen right outside Stuttgart. There was still a lot to do before the registration opened. Signage for all the rooms, sort the badges for easy check-in, set up the registration desk etc. I also had to setup my own booth in the sponsor area where I would demo DomainPatrol Social for IBM Connections. Busy morning! And BAM!, the bused arrived from the hotels. Immediately I took place in the registration desk with 2 of my coworkers in the Social Connections team. Check-in went well but a bit stressful. We handed out badges, welcome packages and a big SMILE to all attendees as fast as we could. We then kicked off the conference with Opening General Session and immediately after that the keynote session "Working out Loud" with John Stepper from Deutsche Bank. A truly inspiring session about working in the open for others within the organization to get involved, to add wisdom, to receive feedback and contributions. It was so rewarding to see how big the audience was. We had an all-time record with 270 registered attendees. Many months we've worked in the team to plan this event. To get people to register, to set the agenda, to work with IBM in Ehningen, to plan 2 evening receptions etc. And to finally see everyone together was a real kick. The day went on with a lot of good discussions around the buzzing sponsor area. I showed our new release of DomainPatrol Social 8 to customers, resellers and IBM:ers. I was glad to understand that more and more customers are now long time users of IBM Connections and it was, as always, very interesting to hear about their success stories or troubles. I don't have to be shy to say that DomainPatrol Social solves many of those headaches administrators have on a daily basis. We closed day 1 with the Speed Sponsoring Session. A returning well appreciated happening. The attendees are divided into groups and have 3 minutes in each booth where they get a short pitch from the sponsor about their products or services. It's always super fun and the adrenaline runs high among us sponsors. Can you say everything you want to say in under 3 minutes?! Of course we can! I won't tell you how to best do it, you have to experience it yourself. The extra good stuff for everyone is that there are many fine prizes to win at the end. What's not to like? For us sponsors it's the perfect way to get to talk to everyone. I am particulary glad that I had the best company in my booth to help me out. Mr Victor Toal, our reseller in the US. After the speed sponsoring we jumped in a car and cruised bravely through and past the taffic jams surrounding Stuttgart on to the venue for the night's Gala Reception Sensapolis. Playtime! We had a couple of fun activities prepared along with dinner. Segway, a climbing wall and karting. After a welcome speach we kicked off the reception with buffet style dinner. I myself had sights set on the climbing wall, and as soon as I finished eating I geared up and went for the top. It was at least 10 years since I hung on a cliff wall last, so it's safe to say I was a bit shaky. But it went well! When I wandered around all the tables afterwards I was very glad to see that it seemed like everyone was enjoying themselves very much! Good food, good friends, fun activities, good talks. A perfect way to end day 1 of the conference! When the party was over it was some sort of relief. Total success and stars all over the sky. The next day was much busier for me in the booth. I could now reap the benefits of the Speed Sponsoring last night, when everyone wanted to hear more than the 3 minutes about what we had to offer. Lots and lots of good discussions and talks. I also took time to visit René Schimmer's session What's coming in IBM Connections Next. It's always interesting to hear how IBM interprets the future and how to translate it into a communication software. They day went by real quick and soon it was time to head for the airport much to soon because of the Lufthansa strike. On the plane home I ordered a tiny bottle of Champagne and took some time to reflect over the last 2 days. I realised that I hardly remembered how my hotel room looked like, or the hotel itself for that matter. Nor did I remember the stressful moments in between things much. But what I really DO remember is all the laughter and fun moments I had. All friends I finally got to see again. All the smiles fired away in my direction. The nice feedback I got the day after the Gala Reception. For example one who came up to me and cheered almost like on a football match. The people in my booth telling ME how good my product is. (I know.. LOL). The discussions in the bar after the Gala Reception. And last but definitely not least the fabulous team that makes this possible. And the amazing fact that I am part of it. Like I said in the beginning: there are different kinds of conferences, and this one is one of the better kind. IBM Sametime is one of the products from IBM we have worked longest with. 15 years ago we laid the foundation for the great expertise and competence we have today. Many of our customers use IBM Sametime as a cornerstone in their businesses, and over the years, product quality and functionality have improved greatly. We know that high quality and standards usually often result in hard work. Companies today is often hard at work maintaining a wide range of technical components in order to maintain the best possible solution. Infoware now offers a new way to access IBM Sametime and experience all its benefits. With the solution from MeetingRite it is possible to have a "private cloud" containing full functionality. We offer instant trial of MeetingRite. Contact us and get access to IBM Sametime’s powerful features by tomorrow! The heat wave in Stockholm right now is making us all longing for a relaxing hammock instead of sitting inside the office. Regardless of that, we are happy to be enjoying a huge interest for DomainPatrol Social from all over the world. The feedback we hear from our customers is that it has never been so easy to administer their IBM Connections environment. DomainPatrol Social opens up possibilities to do things you normally can't do in IBM Connections. Such as Merging Communitites, even one external with an internal one. The feature Merge Profiles is also a popular one. When companies hiring former temporary employees the users often end up with 2 profiles. The next release of DomainPatrol will include a function our customers have had high up on their wish list. We are talking about Quota Management for Files! You will finally be able to set quota on both user level and community level. And also manage quota policies. Good, huh? And we're not stopping there. We are currently working on several features to make DomainPatrol Social the most competent and qualified tool for IBM Connections on the market. Contact us directly to try it out for free or just to let us tell you more. Free your mind – Infoware Innovation and Idea Jam is here! 2015 is turning out to be a year of lots of new things for us here at Infoware. You may know that we have been around since 1995, but that doesn't make us neither old, contempt or bored. We are as curious as ever on what's going on in the world, and how we can bring home new innovations, new ways to work, a more social and effective mindset and so on, to our customers. Simply a better day at work! Not only that, we also do like to contribute to the constant evolving world. One way of doing that is to develop products that makes life easier for our customers. And we think that we are doing something right, since we currently have more than 1,000,000 product licenses running out there right now. So, so far so good, right? Yees.. But no. We want more! One day the other week at the office, one of our senior developers hatched the idea that it would be interesting to hear if any of our customers, resellers or other friends is walking around with a fabulous idea they don't know what to do with. Maybe they have no one to tell it to, and noone who can develop it. That made us think. And do some planning. So, welcome to Infoware's Idea Jam! The first in its kind. Our plan is to collect ideas and suggestions for innovations, and see if we can do something with them. If we can implement them in one of our products. Or maybe develop a new one. The ideas can be small or huge, it doesn't matter. The theme for our idea jam is "simplify our workday with social tools". Since we work with IBM's social software this is the area we target. The Idea Jam is live until the 22th of May 2015, so feel free to submit your idea below, right now! What happens with your submitted idea? All ideas will be reviewed by our team of developers, and you will of course receive feedback directly to you. The best idea wins a fabulous pair of headphones! So join us and submit your idea here! 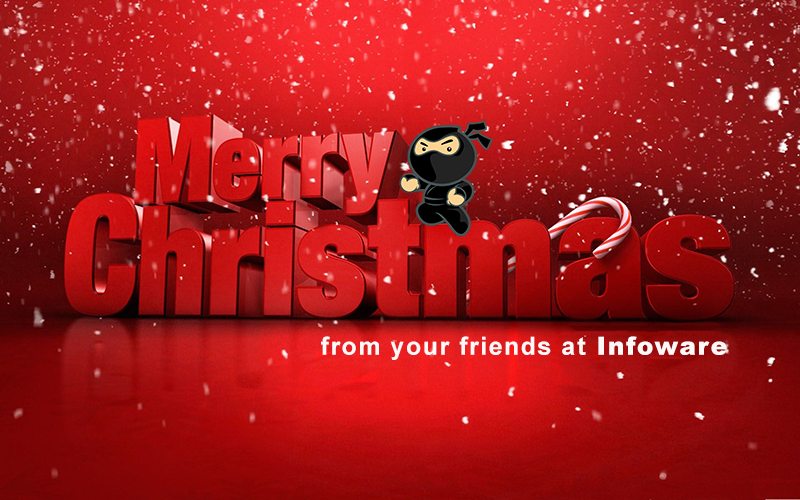 Infoware wishes to thank all of our customers and friends for a fantastic year! We started off in January with the great conference IBM Connect in Orlando. Our product DomainPatrol Social did indeed hit the charts, and we have had a really busy year, taking care of all the new contacts we made. We are proud to announce that we now have several new customers using our IBM Connections tool. And with this, our knowledge about how you want IBM Connections shall be modeled and used, is growing by the day. All this nice feedback and credit gives us a real energy boost to continue to use our expert skills in developing DomainPatrol further! Our room booking app for mobile devices, Rooms & Connections, has also received praise, and since we see an increasing interest for mobile apps in total, we are keeping up the speed in developing new versions and with extended functionality! We are more global than ever! Our technical experts are increasingly demanded by customers abroad. We suspect it has something to do with our knowledge and experience within social business, infrastructure and development work. The other day we celebrated a very sucessful, fun, challenging and rewarding year at our annual christmas party on a restaurant in the beautiful Stockholm archipelago. A relaxing evening with coworkers where we planted a seed for a promising new year 2015! Our new mobile room booking app has rendered interest from customers as well as partners. We will now show it live in one of the sessions at IBM Connect Stockholm 2014 on February, 19. Don’t miss out! Our room booking app allows you to quickly and easily get an overview of all your organization’s meetings and room bookings. With the app you can book rooms, check the booking status and above that contact your colleagues. All in your mobile device! Ulf Stider will furthermore discuss mobile development, IBM Worklight, XPages and Open Ratio. Infoware have a strong feeling and commitment about the environment and saving the world to future generations. We try to make a difference in all the daily investments we make, such as transports, office supply, recycling, and even which coffee we drink at the office. In that point of view it felt more than right to give a holiday contribution to the Swedish non-profit environment organisation Naturskyddsföreningen. Click on the picture below and read all about how you can contribute you too! When I talk to Infoware-collegues at IBM Connect I hear reactions from booth #c26 like “mind-blowing”, “extraordinary”, “perfect”, “great” etc. If you are attending- check for yourself. Get a demo of #DomainPatrolSocial. I will continue to follow from @infowaresweden headquarters. Best wishes from a rainy Stockholm.